The Comichron estimates are now available for comics and graphic novels shipped by Diamond Comic Distributors in October, and as reported here Friday, we saw a mild increase in overall sales during the month driven in part by a much larger slate of new items. Click to see the detailed comics sales estimates for October 2016 (or scroll down to see just the basic charts). A couple of things will be immediate note. While reports had circulated that Marvel had shipped 400,000 copies of Champions #1, Diamond is only estimated to have shipped 328,165 copies in October. There's nothing unusual in this, and the Diamond figure supports rather than undermines the report. There were variants that went to GameStop and WizardWorld, among others, that possibly would not have been counted in the tally. And as always, the Diamond charts only report what it shipped in the month to North American stores, meaning overseas copies and reorders outside the time period are not included. 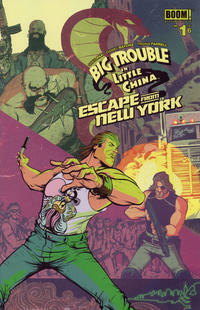 Second, as noted Friday, we do have a Loot Crate comic again in the form of the chart-topping Big Trouble in Little China/Escape From New York #1 variant that it received from Boom through Diamond. It's the first one we've seen since the spring of 2015, and in that time something has changed: the repackager appears to have accounted for fewer copies this time. Diamond reports shipping 421,625 copies of the Big Trouble issue; back with Boom's Bravest Warriors: Tales from the Holo John #1 in May 2015, Diamond shipped 502,737 copies. That likely puts the Loot Crate order somewhere in the 300,000s for October 2016's chart-topper, while it was in the 400,000s for the Bravest Warriors book. Orphan Black #1, back in February 2015, would likely also have had a Loot Crate order of well over 400,000 copies. It's unclear whether this represents an enduring change in the number of comic books Loot Crate orders or a one-time event. Champions #1 had at least fourteen variants of its own offered into the Direct Market, and while that would seemingly suggest something about how much the second issue's sales might drop off, it's hard to put a percentage on it. Sales data on the highest profile first-issues hasn't been of much help in predicting second-issue sales in a long time. Multiple variants and other promotions complicate whatever predictive ratios used to exist. Champions #1 could have accounted more a little more than half the market share difference between Marvel and DC in October, but that estimate is difficult to make as market shares are based on wholesale dollars and we don't know what the average discount received was for the book. 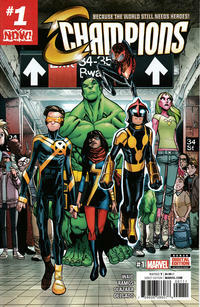 The average comic book in the Top 300 cost $3.93; the average comic book retailers ordered cost $389. The median and most common price for comics offered was $3.99. Click to see comics prices across time. As noted Friday, the market remains on track for a year that's slightly in positive territory — but 2016 will not be as big a growth year as 2015.